Immigration is a hot topic in the news these days. See what some of the latest headlines say about immigration law and the people it affects. An illegal immigrant was arrested by federal authorities from a courthouse. He was in court for a misdemeanor domestic violence charge and was waiting to see the judge when plainly dressed ICE agents arrested him. Genaro Rojas-Hernandez, 30, was sitting on a bench with his legal aid when the ICE agents arrested him. His lawyer was permitted to speak to him after she got word from the judge that he was being detained. ICE agents followed proper procedure to make the arrest, but it was met with displeasure by defense lawyers in the area. The agents did not make the reason for the arrest exceptionally clear, but they informed the judge of their intent to arrest Rojas-Hernandez. Read the full article on New York Daily News. Hollywood actor Bambadjan Bamba was brought to the United States from Ivory Coast by his parents when he was 10 years old. For years, he didn’t know the severity of his immigration status until he tried to apply for financial aid to college and was denied. He was granted temporary resident status with the Obama-era program known as Deferred Action for Childhood Arrivals, which protects children illegally brought to the United States — an estimated 800,000 people. With the status of DACA currently dismantled by President Trump’s executive order, Bamba felt it was time to become a public face for other immigrants currently protected by this program. He talks about how Hollywood has a great cultural impact in the United States and can help take real, concrete action to protect the many talented actors and actresses who happen to be immigrants. During Donald Trump’s campaign to become President of the United States, he made a strong point to “Build the Wall” in an attempt to better control the border between the U.S. and Mexico. However, since his election, it is obvious that the physical wall is less likely to be constructed, but that doesn’t mean policy won’t be written to make the metaphorical wall stand tall against immigration practices. It is actions such as these that slowly but surely build a rhetorical wall around the United States. For the better part of a decade, Latino millennials in Arizona have felt discriminated and racially profiled because of a controversial immigration bill, SB 1070. Essentially, SB 1070 gives permission to law enforcement officers to ask for proof of citizenship if they had “reasonable suspicion” that the person in question was in the country illegally. This led to a form of racial profiling and ultimately fear among the Latino and Hispanic communities in Arizona and around the country. In the same time frame as SB 1070 was created, Arizona Latinos were dealing with the anti-immigrant sentiment from former Sheriff Joe Arpaio. Arpaio was infamously known for immigration roundups and was found guilty of criminal contempt. Last year, President Trump pardoned Arpaio, which was quite controversial. Through all of these challenges, Latinos in Arizona and around the country have rallied together to form grassroots organizations, encouraging fellow Latinos to vote and to make a difference in immigration policy. In the wake of the terrorist attack in New York City when Sayfullo Saipov drove a truck onto a crowded bike path on Halloween, President Trump declares a repeal of the immigrant lottery system is a must. Saipov came to the United States in 2010. The article reports that when Saipov connected with ISIS is still unknown, but that this attack was in clear connection to the terrorist group. From the beginning of his campaign, President Trump has called for “extreme vetting” of people who want to immigrate to the United States. Trump called on Congress to immediately end the Diversity Visa Lottery Program, which was created in 1990 by former President George H.W. Bush. Read the full article on ABC Local 10 News. 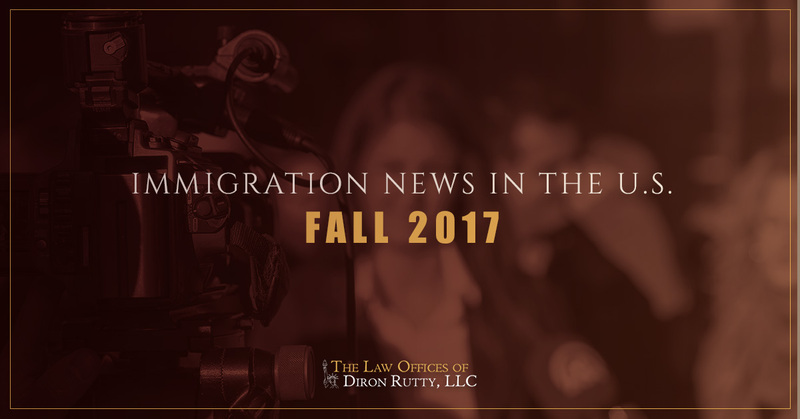 For more than 20 years, The Law Offices of Diron Rutty, LLC, has been representing individuals in New York City and Poughkeepsie regarding the serious matters of immigration law. Attorney Diron Rutty recognizes the importance of these legal matters to you and your family, which is why she will do whatever it takes to provide you with the answers you need or to refer you to someone who can get those answers to you as soon as possible. Connect with us today for a free initial consultation about your legal matter. We are realistic, straightforward, and compassionate. Fill out the form below for all online inquiries.